“It just look like a pile of rags, floating on the water. Jean sat on the bench with the brass plaque on. It said: In Memory of Norman Reeves, who spent many happy hours here. The plaque means Norman Reeves is dead, but it doesn’t actually say that. Jean held her head in her hands and her body was all jerky, like when you are laughing or crying, I guessed she was crying and I was right. Jeans friend has been murdered. But the police don’t agree. To them he was just another homeless person who’s fallen into the river after one too many drinks. Kieran cares though, and he is going to find out what happened to the homeless man. Maybe finding that out will help he gather clues as to where his grandmas gone and why she doesn’t try to contact him anymore. Its a good job Kieran remembers to take everything in and write it all down, but when you’re Kieran and the world works in different ways its hard to get anyone to believe you, especially when there are secrets everywhere; including at home. Such an incredible book which could have easily dropped into the category of ‘another book about a kid with learning difficulties’ but which stands out from the crown because of the beautiful relationships and friendship that are present in it and how it says more about the other people rather than the protagonist himself. I really loved the story and I think the use of Kieran as the main character topped it off well. Any other kid would have been believed when they told their parents and teachers things but Kieran was viewed as being in his own world too much. With his difficulties and a home life which was not ideal in the slightest its no wonder things kinda spiral out of control for him. The story does focus on finding out what happened to the homeless man but in doing that you find out other things about Kieran’s family and I loved that. There were many characters in this book who I thought were horrible, others I felt sorry for, and some that I loved. Tony was the worst and I hated him from the minute I heard about him. He was selfish and evil and I don’t want to think that there are people like that in the world – but unfortunately I know there are. Ryan was a git as well but I felt sorry for him because everything he did was for his dads approval and it really didn’t get him far! Kieran’s mum is a hard character to love because she lets things carry on, oblivious to whats really going on but I still felt sorry for her too. I liked that the book allowed you to see people in different lights though and how it kinda made you think twice about judging people when you first meet them. Jean was one of the best examples of this as even though she is a homeless person its not because of current substance abuse and her grief caused all her problems. Another great example is the security guard at the hostel who at first Kieran thought wasn’t nice but turns out to be pretty ok. I love books like this which focus on finding out the truth from a mind who is often sheltered from it. The innocence and the way Kieran looks at life is perfect and I really did enjoy this read. Its definitely one to add to your shelf for next time you want a great read! 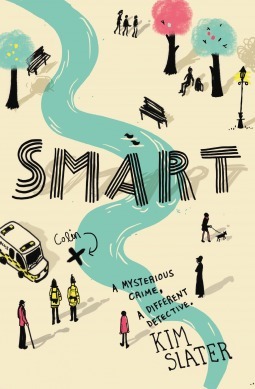 Smart will be published by Macmillan Children’s Books on June 5th. My copy was sent by the publisher in exchange for an honest review. This looks like such a touching story!